I’m Not Very Good At This | Marbles In My Pocket ~ The Official Blog of Charles L. Mashburn ~ Poems, Short Stories, and random thoughts from the author of "Be Still... and know that I am God"
My golf game is too often quite amusing, and I try not to take it too seriously. It’s a good thing too, because it sometimes seems the harder I try to be better at it, the worse I get. 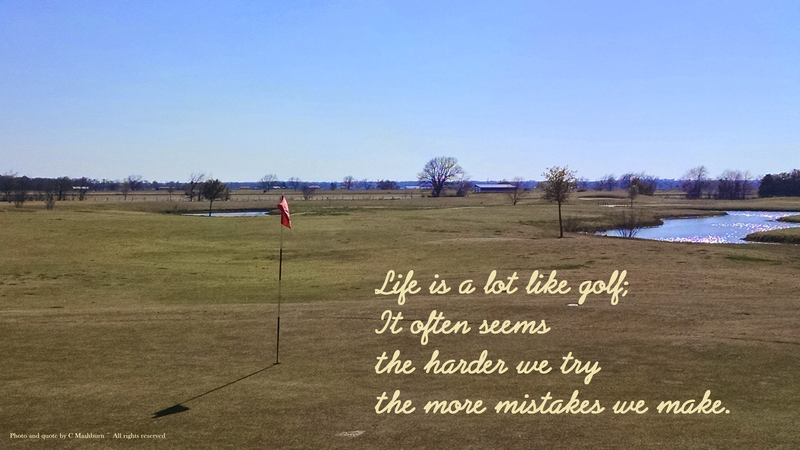 Life is a lot like golf; it often seems as though the harder we try to be good and do what’s right, the more mistakes we make. I’m beginning to realize we do our best when we relax and enjoy the things God surrounds us with. When we try too hard, we start missing the mark, and find ourselves in trouble. We’re going to make bad shots in life—we’re going to sin—and we’ll probably never be as good as we want to be—we’ll fall short of the glory of God—but if we focus on God, He will make us as good as He wants us to be.